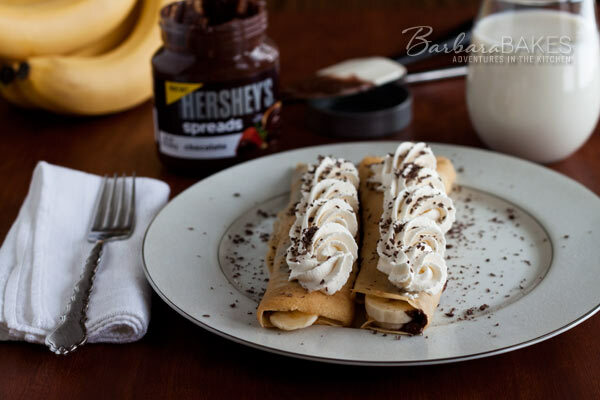 Thin, tender crepes wrapped around a smooth, rich, creamy chocolate filling and sweet sliced bananas, then topped with swirls of whipped cream and finished with a sprinkling of grated chocolate. A decadent breakfast for a special occasion or to make any day a special occasion. I have such fond memories of eating crepes in Paris. They sell them from street carts just like you’d find hot dogs carts in New York City. Late one night while we were out exploring the city I bought my favorite crepe; a huge crepe filled with a chocolate hazelnut spread. The crepe was warm and the chocolate soft and melting. It was folded in quarters and luckily wrapped in paper or the chocolate would have dripped all over my hands. My husband and I shared it, but I found myself wishing we’d each bought one so I could eat the entire crepe myself. 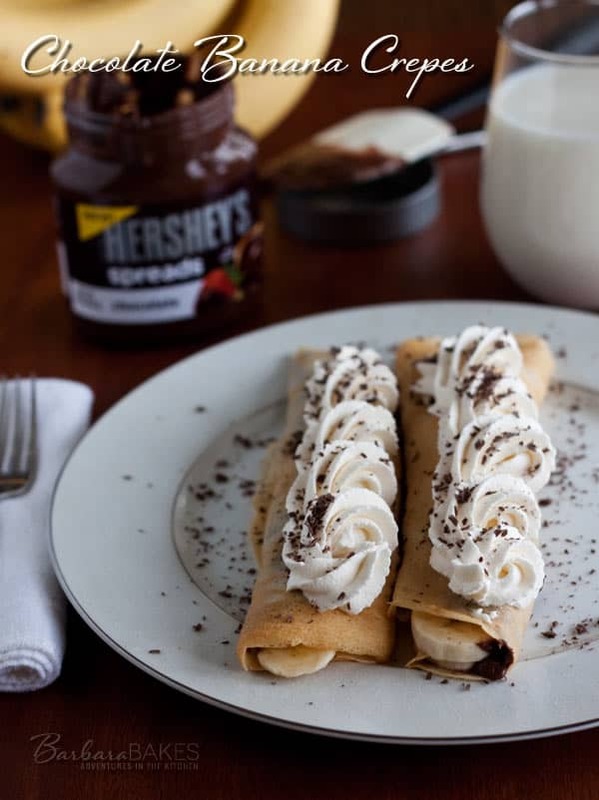 Chocolate filled crepes are super easy and fun to make. Just use a good non-stick pan for cooking the crepes and spray it with non-stock cooking spray. When you’ve cooked all the crepes, slather some chocolate spread down the center of the crepe. I used a spatula to spread the chocolate. It spreads easily, especially if the crepe is still warm. Layer on some sliced bananas. Roll it up and top it with some whipped cream and grated chocolate. The whipped cream and grated chocolate are optional, but really do make it look special. I’ve teamed up with Hershey’s for this post, to help spread the news about their new chocolate spreads. They come in three flavors, chocolate, chocolate almond, and chocolate hazelnut. My kids don’t like Nutella so I used the Hershey’s chocolate spread for them and the Hershey’s Chocolate Hazelnut spread for my husband and myself. I’ve been saving the spreads in the box Hershey’s sent them to me in, so that no one would use them up before I’ve had a chance to experiment with them. I’ve been dreaming up so many fun ideas to help them spread the possibilities, so stay tuned. Heat an 8-inch non-stick skillet or crepe pan over medium heat and lightly coat with butter or cooking spray. For each crepe, pour 1/4 cup batter into the center of the skillet and immediately rotate the pan until the batter covers the bottom of the skillet in a thin layer. Cook until light brown and the top begins to dry out, approximately 1 minute. Flip and cook an additional 30 seconds. Repeating with remaining batter. Stack completed crepes on a plate. (If your crepes are sticking together, put wax paper between the crepes.) You can put crepes in a 200º oven to keep warm until ready to serve. 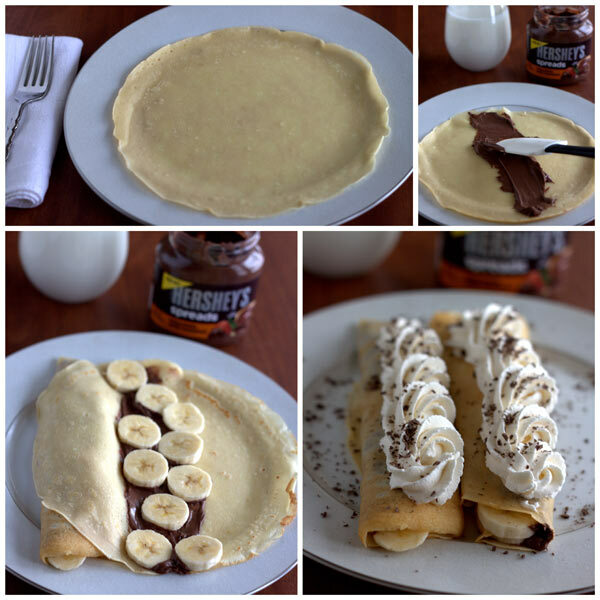 Spread chocolate spread down the center of each crepe and top with sliced bananas. Roll up and serve with whipped cream and grated chocolate, optional. Disclosure: This post is sponsored by Hershey’s, but all opinions expressed are always my own. The crepes look so tempting..Yummy..Thanks for sharing!